1st Prelude: History. --- "And after these things, Joseph of Arimathea, because he was a disciple of Jesus, but secretly for fear of the Jews, besought Pilate that he might take away the Body of Jesus. And Nicodemus also came, he who at first came to Jesus by night, bringing a mixture of myrrh and aloes about a hundred pounds' weight. They took, therefore, the Body of Jesus and bound it in linen cloths with the spices, as the manner of the Jews to bury. "Now there was in the place where He was crucified a garden, and in the garden a new sepulchre wherein no man had been laid. There, therefore, because of the Parasceve of the Jews, they laid Jesus, because the sepulchre was nigh at hand. And returning, they prepared spices and ointments; and on the Sabbath day they rested, according to the commandments" [John xix]. 2nd Prelude: Composition of Place. --- The summit of Calvary, close to Jesus' Cross, with the Holy Mother, John, Magdalen, and the Holy Women. Then the Sepulchre and the Cenacle. 3rd Prelude: Ask what I want. --- To realize our Lord's love for me; to understand the Mystery of the Cross and to value it; the grace of true detachment from the world and self; that I may ever live with Mary my Mother and be a joy to her. Points: I. The taking down from the Cross. II. The burial of Jesus. III. The solitude of Mary. Contemplate the heart-breaking situation of the Mother of Jesus. As evening came on, it grew quieter and quieter around the Cross of Jesus. See the soldiers occupied in dragging the dead bodies of the thieves down to hill to the common burial-place. See the Immaculate Mother --- her eyes fixed on Jesus. Oh, with what unutterable pain Mary contemplates this Holy Body hanging on the Cross --- now robbed of all form and beauty, even of Its soul --- torn and shattered, borne down by Its Own dead weight on the Cross. She could not take Him down, and had no grave for Him. Any request from her might result in grosser execration. The Holy Mother feared every moment that the soldiers would come back and drag away her dear Son's Body also to the burial-place of criminals. It was considered a disgrace among the Jews not to be buried in their own family sepulchre. The Mother of Jesus had always been poor --- poor in Bethlehem, poor in Egypt, poor in Nazareth --- but never had she felt her poverty so bitterly as here in the sight of her Jesus' dead Body. Note the party of men passing through the judgment-gate bringing ladders and many other things. They are hastening rapidly towards Calvary. Our Blessed Mother, sick at heart, asks John anxiously: "Who are coming?" At last, when they are near enough, John whispers to the Blessed Mother that she has nothing to fear. They are friends. Joseph of Arimathea was a disciple of Jesus, but secretly for fear of the Jews --- Nicodemus likewise. But lo! Jesus in His Death has made all things new. Joseph and Nicodemus are not afraid now. The Passion of Christ has strengthened them. Scarcely had Jesus breathed His last sigh than the efficacy of His Blood inspires them with a courage they had not known before. They are determined to honor the Body of Jesus Whom they recognize as the Messias. At once Joseph goes to the Praetorium and boldly asks Pilate for the Body of Jesus. A glorious testimony to the innocence, sanctity, kingship, Divinity of Jesus, all of which have been well proved by the miracles of His life and death. See with what ardor and reverence they approach the Sacred Body of Jesus. They salute the Mother of Sorrows, but neither can speak, their hearts are full of emotion and deepest sympathy for the Mother and Son. The beloved disciple joins them --- all prostrate and adore Jesus on the Cross. Then the ladders are placed against the Cross and they begin the most sacred of duties. Note how lovingly and reverently they touch the Sacred Body. First, the crown of thorns is removed --- kissing it reverently they give it to the Immaculate Mother, who stretches out her hands to receive it, and she, too, kisses it and presses it to her heart. With the tenderest care the nails are drawn out, and passed one after another to the heroic Mother. See how gently and with what reverent love Joseph and Nicodemus wind linen bands around the limbs and then lower the Sacred Body to the ground. John holds the Adorable Head, Joseph and Nicodemus support the Body, and Mary Magdalen --- always at her chosen place --- takes the Sacred Feet of the Divine Master. No priest can treat the Blessed Sacrament with more care and reverence than these holy men of high degree treated the Body of Jesus. How dear they must be to us for their love of our Lord, and His Holy Mother, and for the generosity with which they give not only their property, Nicodemus his wealth and Joseph his sepulchre, but also themselves, the personal service of their hands; and lastly, for their courage. It is not without significance that we are told that Joseph went "boldly" to Pilate. It really needed courage to do this, seeing the fanatical hatred borne by the Chief Priests and Rulers to Jesus, and the victory they had gained over Him. Joseph's and Nicodemus' sympathy for the fate of the Crucified --- their intervention for Him --- and the public burial they gave Him --- might well be regarded as a demonstration of opposition, and might have the worst consequences for themselves. But they care nothing for all this. They came to know Jesus, they love Him, and everything must be done to serve and honor Him --- Love is proved by deeds! These noble-minded men and their act is the first victory of the Death of Jesus, and a fruit of our Lord's gentleness and patience. "And I, if I be lifted up from the earth" --- by being crucified --- "shall draw all to Myself." He did not take it amiss that they kept the fact of their discipleship secret for a time. Jesus waited patiently, and now His patience has borne fruit. And this is all the more wonderful --- seeing that they were the only ones of all the disciples and Apostles, except St. John, who openly declared themselves for Jesus and espoused His cause. As soon as the Sacred Body is lowered, going a few steps they place the "World's Treasure" in the winding-sheet that our Lady has spread on her knees. Then all prostrate and adore. I also will kneel and adore, fixing my eyes alternately on the Sacred Body of Jesus and on Mary. Contemplate lovingly, and mark how all who surround the Sacred Body of Jesus preserve a religious silence! How the Blessed Mother's heart speaks to her Beloved Son as she gazes on His bleeding face, His glazed eyes, His mangled body, His pierced hands and feet, His opened side. She speaks to the Eternal Father, the Holy Angels, the faithful friends of her adorable Son, she looks over the whole human race for whose redemption Jesus has suffered and died. She prays for all --- for me! How reverently Jesus' faithful ones listen to the Immaculate Mother --- her words are loving and tender --- they illumine the mind and move the heart. Mary's incomparable grief alters neither the peace of her soul nor the majesty of her countenance, and "in peace is her bitterness most bitter." What were the Holy Mother's thoughts as she gazed into the five wounds and sees the Sacred Body covered with gaping wounds and bruises, battered out of all shape by the cruelty of man! O Mother of Sorrows, great as an ocean is thy sorrow! What must be thy hatred of sin, when thou seest what it has wrought in the Divine beauty of thy spotless Son! What a mixture of agonizing compassion and mournful sorrow, of hope and consolation, gratitude and triumphant joy, fills her holy soul while she looks on the dead Body of her Son. The day on which Jesus died is indeed well called Good Friday. It is the day when Jesus consummated His victory over death. Shall I not condole with my Mother --- the Mother of Sorrows --- as with unutterable woe she lives through the whole Passion again, following it out by the dreadful traces it has left? Now she sees it all close at hand. What have I to say to her as she arranges the hair, touches, kisses, and closes the wounds? And of what does she think? Surely of happier times --- of the hour of the Last Supper --- the majesty and nobility of His Sacred Person during the three years of His public life --- of the sweet days in Nazareth and Bethlehem. See! the Babe of Bethlehem has come back to His Mother's lap. But how differently His arms are stretched out now! Oh, of what do all these wounds speak to the Blessed Mother, if not of His love for us? We were bought with these wounds, this Blood, and this death. How could she help loving us? How could she forget us? We are graven on her heart in a thousand wounds. Everyone who passes by the Cross sees the Mother there with her dead Son on her lap, and blesses God for having so confounded our enemies through her means. Blessed art thou --- above all upon earth! O Holy Mother, Queen of Martyrs, imprint deeply on my heart the wounds of thy Crucified Son. So long as this heart of mine shall be capable of loving, it will love thee. O Mother of Jesus, and my Mother, too --- yea --- it will burn to influence all hearts with the same fire of love --- that all may begin upon earth to love thee for the sake of Jesus --- and Jesus for His Own dear sake. O Mother, give me to Jesus! Now and at the hour of my death. Amen. The evening shadows grew longer and the Parasceve was drawing rapidly to a close --- so the men see haste must be made to bury Jesus. Joseph, John, and Nicodemus beg the Holy Mother to allow them to complete the embalming of the Sacred Body. They reverently lift the Sacred Body of Jesus from His Mother's knee, and carry it to the stone of anointing, which is still shown and venerated in the Church of the Holy Sepulchre. There they prepared it for burial according to Jewish custom. They wrapped the Body of Jesus in fine linen cloths and bands, and placed spices and sweet-smelling herbs between it and the linen; sprinkled the linen itself with sweet perfumes --- covered the Sacred Head with a napkin. See Mary herself performing this last duty. Oh, with what woe she gazes for the last time on the dead face of her beloved Son! The sun of her life has set with the covering of Jesus' face! The preparation of the Body for burial was such as rich and respected men received. The preparations being completed, they proceed to inter the Body. It was already late, probably about five o'clock in the evening. The site where our Lord was to be buried was situated about fifty paces northwest of the place where the Cross stood. It was fortunate that the distance was so short, on account of the nearness of the Sabbath. The sepulchre was in a garden, and was hewn in the rocks and thus protected by nature against violation and profanation. It was quite new and unused, as befitted our Lord in regard to Whom everything must be pure and inviolate, as had been the womb of His Mother --- to which the Holy Sepulchre is often compared. As a Joseph had once helped Mary to lay the Infant Saviour in the manger, so it is now a Joseph, too, who helps her to lay Him in the grave. Follow the little procession of mourners as they go down the hill, through the ravine, straight across to the garden, the three or four men bearing the Sacred Body of Jesus --- His Mother, Magdalen, the Holy Women, and a few servants follow closely. When they reach the sepulchre our Blessed Lady spreads a white cloth in the tomb. Then the Body of Jesus is placed on the stone --- there to remain until the hour of its joyful Resurrection. Contemplate It as It lies there --- disfigured by countless wounds and scars --- apparently lifeless --- yet nevertheless the joy of God and worthy of our highest adoration. Passive and cold and motionless --- but soon to be radiant with the most dazzling beauty --- dead but belonging to a Divine Person. From this we may learn (1) the glory of suffering, (2) the power of apparent helplessness when God is with us, (3) the beauty of passive obedience, (4) the true life of those who are dead to the world. Mark how, before closing the entrance to the tomb, all fall on their knees and adore the Sacred Body, shedding many tears --- in spirit I can unite with all these loyal, devoted servants of our Lord, and adore, love, and thank my dear Master for all His goodness to me. Then they lead the Mother of God back to the Cenacle --- leaving their hearts where their Treasure rests. In passing before the Cross our Blessed Lady prostrates, and is the first to adore the Sacred Sign of our Redemption. All who accompany her follow her example. Watch --- and listen --- as the Holy Mother and Jesus' devoted servants reach the Cenacle. Our Lady, before entering with John, Magdalen, and the Holy Women, thanks most tenderly the faithful friends of Jesus --- she blesses them for the love with which they have rendered Him the last duties, and saying with fullest confidence: "The God of our Fathers will not permit His Holy One to see corruption." What was our Lord doing while thus apparently inactive in silent tomb? He was beginning His work of triumph; announcing glad tidings of salvation to the holy Souls in Limbo, among whom appeared the penitent thief, in fulfillment of His promise, "This day shalt thou be in Paradise"; dethroning Satan and changing the king of this world into the Kingdom of God and of His Christ. So it is with us. When we seem useless and apparently doing nothing, we are often doing great things for God! Our tabernacles are so many tombs where the Body of Jesus is buried. What is my assiduity in visiting the Hidden God? What is my devotion, my respect in His Divine Presence? Are not our hearts so many tombs into which Jesus deigns to descend? Is mine a garden enclosed? --- cultivated --- adorned with flowers of virtue, especially purity, love, humility, desire? Is this garden of my soul silent from all din of earthly, worldly things and dedicated to Him alone? His Sacred Body embalmed by my love, and wrapped in the clean winding-sheet of purity of intention? If this be so, His Presence in my soul when I have received Him in Holy Communion will be the pledge of my glorious resurrection with Him. The rock signifies stability in good --- "Be ye steadfast and immovable." COLLOQUY.--- O Jesus, would that all might know and love Thee! Would that I never displeased Thee! Now, dearest Jesus, I begin. I must serve Thee with all my heart's love, with all my strength. Would that I possessed the hearts of all, that I might consecrate them to Thy love! Help me, dear Lord, to make some return for all Thy loving patience with me in the past. O Jesus, the life and delight of soul! How unutterable is the love wherewith Thou hast loved me! Grant, Lord Jesus, that from this day I may begin to serve Thee in earnest --- give of my best --- give fearlessly --- and from purest love. Grant that my life may bear much fruit of holiness, and so show forth the Divine power of Thy grace and love, and promote Thy greater glory. O Mary, Mother of God, my Mother, for the love of thy Divine Son, keep me always close to thy pure heart --- shield me from the devil, the world, and my own evil nature --- that I may become thy true child and the devoted Spouse and Apostle of Jesus. O Mother, I have need of thee; O Mary, be propitious to me! Good Friday Night. --- I shall see the Mother of Jesus, John, Mary Magdalen, and the other Holy Women who were with her. How great their sadness! All are plunged in desolation because Jesus is no long with them. 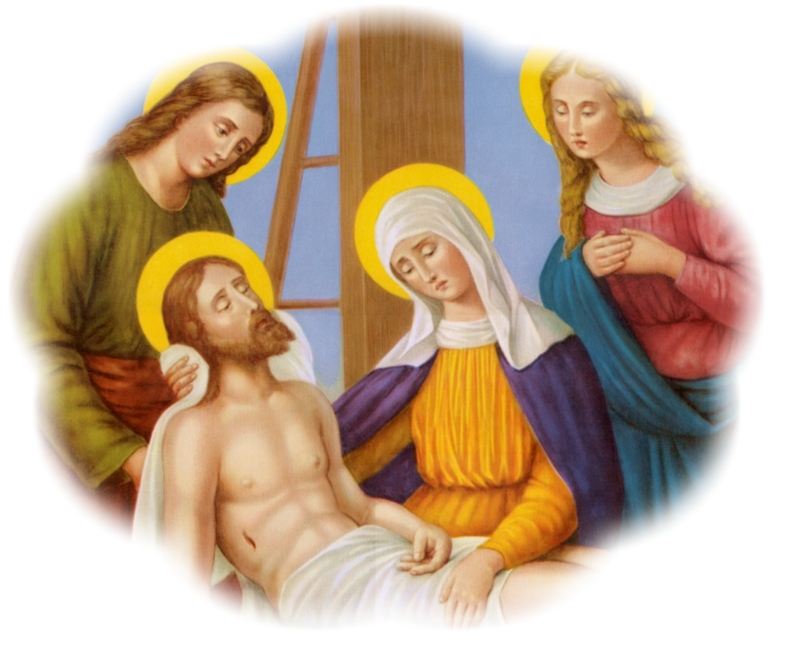 They spend the first hours of the night in speaking of the sufferings and death of our Lord. St. John relates all that took place the Cenacle the evening before. I shall listen to the beloved disciple --- he relates how the Divine Master ate the Paschal lamb with the Twelve --- how Jesus washed their feet --- how He instituted the adorable Sacrament of His Body and Blood --- how their hearts glowed with love when He discoursed with them after the departure of Judas --- how He told them all that was to happen to Himself --- how He prayed for them, and led them from the Cenacle to the Garden of Olives. On the way He told them His Soul was sorrowful unto death --- that they would all be scandalized in Him that night. Then St. John described with many tears the awful Agony in the Garden --- the kiss of the traitor --- the seizure --- how all His Own abandoned Him. Thus does the adopted son endeavor to soothe the grief of the afflicted Mother. I, too, am Mary's child --- and should I not strive to console her by speaking lovingly to her of what Jesus has done and suffered for me? In that Mother's pain untold?" Holy Saturday.--- The Sabbath now began --- a day of quiet mourning and hope. Its character is a mixed one --- the dusk of Good Friday and the dawn of Easter Sunday seem to blend together. On this day the occupants of the Cenacle are quiet, very quiet. They have much to reflect upon, much to mourn over, some much to repent of. One sees only eyes reddened with weeping --- tears still flowing --- little is spoken. The preceding day with all its terrible incidents oppresses every heart with bitter pain. Jesus, their beloved Master, the God-man had suffered --- was dead --- lay buried outside the city. Our whole life ought really to be like this. We ought never to forget that our dear Lord has suffered and died --- even though it happened long ages ago. A noble heart is never indifferent to this thought. How silently reverent some of the occupants of this house are! And yet what deep consolation they find in the thought that they have remained true to our Lord to the end. John, Magdalen, the Holy Women! See the Apostles and disciples coming one after another humbly asking admittance. Those within full of kindness --- receiving, encouraging, and comforting them. Peter came overwhelmed with contrition and shame confessing his sin with many tears --- all the Apostles are sad and inconsolable. They dare not think of the past, nor yet of the future. And who is now their comfort and support? Our Blessed Lady --- the Mother of their beloved Master. In the midst of all the woe and pain that rent her heart, Mary was still calm, firm, unbroken in her trust --- and a comfort to them all. Then, as now, our life, our sweetness, and our hope. Whilst the Good Shepherd Who had given His life for His flock was in Limbo consoling by His Presence the just souls confined in that dark abode, He did not forget the little flock He had left defenseless on earth. He inspires them to seek His Mother who is to strengthen and console them in His absence --- "Having loved His Own who are in the world, He loved them to the end." The grief of the Apostles was great, seeing their number reduced to eleven --- the thought of the ruin of Judas was bitter in the extreme. 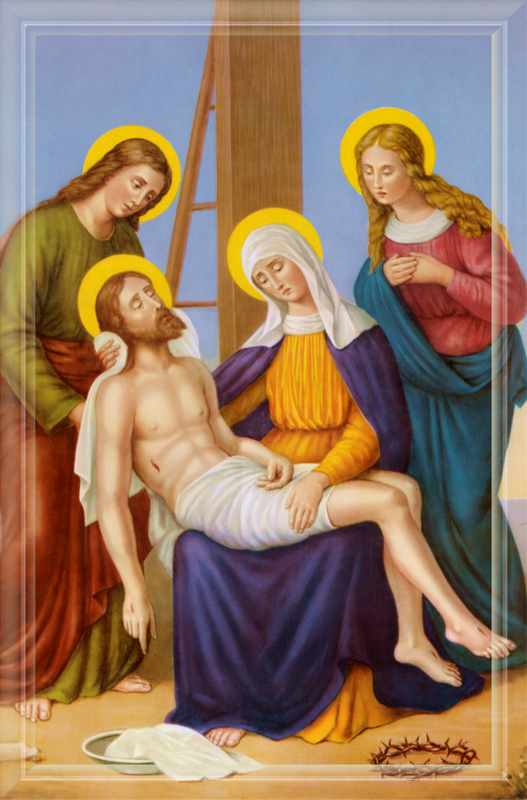 Ah, if the unhappy man, detesting his awful crime and ingratitude, had come as Peter, to cast himself at the feet of the Mother of Mercy -- -how tenderly she would have received and consoled him! What a lesson for all of us! No matter what our weakness, sinfulness, unworthiness, we need never lose heart at the remembrance of past ingratitude --- if we fly to the Refuge of Sinners, the Mother of Mercy, the Mother of Jesus --- she will gain a full pardon, and the grace of true and perfect conversion from the adorable and loving Heart of her Divine Son --- "My little children, these things I write to you, that you may not sin; but if we sin we have an advocate with the Father --- Jesus Christ the Just" (1 John ii. 1.). And we have also our advocate, the Mother of the Saviour, Who confided us to her maternal heart before expiring for love of us on the Cross. COLLOQUY.--- Mother most pure, most holy, most kind, may the love of Jesus and of thee grow in our hearts together. May that love make us fear and hate sin and the world, Christ's enemy. Strengthen us to deny ourselves constantly and generously, confirm our faith, hope, and charity, and be with us in the hour of death. O Mary, our Mother, thou art our hope in life, and wilt be our joy for ever. From thee, dearest Mother, we receive all blessings, for through thee we have Jesus, the source of all our grace. Ah, dearest Mother, was it not as thou didst watch thy Divine Son on the Cross, that thou didst learn that immense compassion and boundless pity, which made thee the Mother of the Apostles --- the Refuge of sinners --- the Promoter of the Sacred Heart's interests in souls. Dearest Mother, let us share with thee thy sorrows --- let thy compassion grow in our hearts and make us like thee. For happy indeed, O Mother of Jesus crucified, is the soul who desires to share in thy compassion --- happier still he who really strives after it --- happiest, supremely happy, he who in compassion and gentleness becomes like thee, O Blessed Mother of God. Saturday Night till Sunday.--- Having consoled the Apostles and comforted the Holy Women, Mary recommends all to remain in the Cenacle. Then she retires to her oratory as on the peeceding night --- to occupy herself solely with the thought of her Divine Son. See our Blessed Lady --- wrapt in deep contemplation, surrounded by numberless spirits who compassionate their suffering Queen. We may reasonably suppose that on this happy night, as the Church calls it, the Mother of God knew supernaturally all that was taking place since her Jesus' Soul was separated from His Sacred Body. Mary sees --- and I will see with her --- how the Blessed Soul descends to Limbo, accompanied by an innumerable multitude of Angels, singing hymns of praise to their triumphant King. The heavenly Spirits command the entrance to the dark prison, to open to the King of Glory --- the God of Armies, Who is I omnipotent in battle. In an instant the subterranean prison is filled with resplendent light by the presence of the Divine Redeemer --- the souls of the Just are made happy in the light of the Divinity. They recognize their God, their Liberator --- they thank Him, and exalt His mercy in canticles of praise. The Mother of the Saviour, witness of these marvels, comprehends that an infinite price was paid for the redemption of the human race, and sees its inestimable happiness in being so gloriously and abundantly redeemed. Mary sees the new Church that Jesus had founded and enriched with His Sacraments and the treasury of His merits. She penetrates deepest mysteries by the light her Divine Son gives her, either through the ministry of Angels or directly from Himself. These sublime considerations cause great joy in the superior part of Mary's soul --- but she begs the Eternal Father to keep it from affecting her senses, for she does not wish to receive any sensible consolation whilst the Body of Jesus remains in the sepulchre unglorified. By this incomparable fidelity she shows her love for her Divine Son, of Whom she is a perfect image --- for her soul was full of joy and her body of suffering --- just as it happened to our Divine Lord through His Passion and even on the Cross. COLLOQUY.--- O dearest Jesus, teach me to be generous --- make me generous --- to give, and not to count the cost. Grant, I beseech Thee --- oh, grant that my heart, wholly united to Thee, may be closed to Thy enemies, dead to myself and to the world --- ever open to Thee, breathing Thee alone --- above all things loving Thee. O glorious Queen of Martyrs, help me to fight bravely against my enemies --- the devil, the world, and myself --- that I may be generous and devoted in the service of thy Divine Son. O Mother of love and sorrow! Love has given thee the Cross, grant that the Cross may give me love! Heart of Mary, my Mother, transfixed with a sword of sorrow, enkindle within my heart, by thy intercession, the Divine fire which consumes thy heart --- which will enable me to practice faithfully resignation, patience, conformity to the Divine Will; to suffer courageously for the glory of God, for the salvation of souls, and for my own sanctification. With the love of Christ, my Lord."